Apple has launched three new subscription services at the Apple Event held in California. Apple has launched Apple TV +, Apple Arcade (Gaming Bundle), all-you-can-read Magazine subscription, and Apple Credit Card with Partnership of Goldman Sachs. Apple has focused on the subscription service this time, whose main goal is to increase the revenues of the company. Apple Chief Executive Tim Cook said on this occasion, “We are also making a growing collection of world-class services, our present day event is about this.” Let’s know in detail about these services of Apple. Apple launched the online video streaming service Apple TV + at this event. This TV app from Apple will soon be available for subscription to users. Through this app, users will be able to access their favorite shows or sports events through an Apple TV + app. In addition, the Apple TV Channel feature will be associated with this app in May. When Apple TV + users subscribe to a channel, they will be able to access any show from that channel through their app. Apple has recently told about the channels like HBO, Showtime, Starz, CBS. However, no information has been given about its pricing. Apple TV + is a kind of separate service that will allow users to access original video content produced by Apple. Apple has partnered with 34 other TV and Movie Productions for this. Many Hollywood artists took part in Apple’s event. Apple’s original content will be available to users in the next few months. Talking about its subscription, users will have to pay monthly rent, although its pricing has not been decided yet. Apart from Apple TV + all the devices in the company, such as iPhones, iPads and Apple TV set-top boxes, will also be accessible on Mac computers. In addition, users will be able to access Apple TVs through the set-top box on TV sets of Samsung, LG, Sony and Vizio. The Apple TV app will also be able to download Roku and Amazon’s set-top box. The Apple News + app was launched in this Apple event, for which US users will be charged a monthly rent of $ 9.99 (approximately Rs.700). Users will get Magazine content in this Apple News + service. Canadian users will have to pay $ 12.99 per month for this. Users will get full access to new and old issues through Apple News +. Apple has also launched a different kind of credit card in partnership with Goldman Sachs. The special thing about this credit card is that it is made of titanium. Apple Card users will also be able to find out how much amount has been spent and how much to pay, through the wallet app of their iPhone. This app will give a detailed account of the amount you spent, in which you will get information on the cost of the category. Apart from this, users will also find Deli Cash Rewards in many ways in Apple Card. If a user changes his address, then it can be done only through a text message. Apple has taken special care of users’ privacy in this card. The company said that neither Apple nor Goldman Sachs will use the personal data of users for any type of advertising. In the Apple News + app, the company has also published some magazines including Wired, Popular Science, National Geographic and Essence. Users of Apple News + will also get the content of Los Angeles Times, Wall Street Journal etc. Apple said that users will be given a subscription of more than 300 magazines. Keeping in mind the privacy of users, the Apple News + app has been developed, because advertisers will not be able to track users in any way. Apple has also launched the Video Gaming Bundle Apple Arcade in its event. For this, users will get access to more than 100 video games through a single subscription. Users will be able to enjoy all these games on Apple’s device. Continued new games will be added to Apple Arcade. The most special thing is that users will be able to enjoy video games offline too. For this, users must download the game in their Apple Arcade. Apple Arcade Service will also be available to users in the next few months. Apple has told that new games of companies like Konami Cartoon Network, Sega and Liga will be available in Apple Arcade. Apart from this Simulation games like Sim City will also be able to play games. However, Apple has not yet said about the pricing of this service. 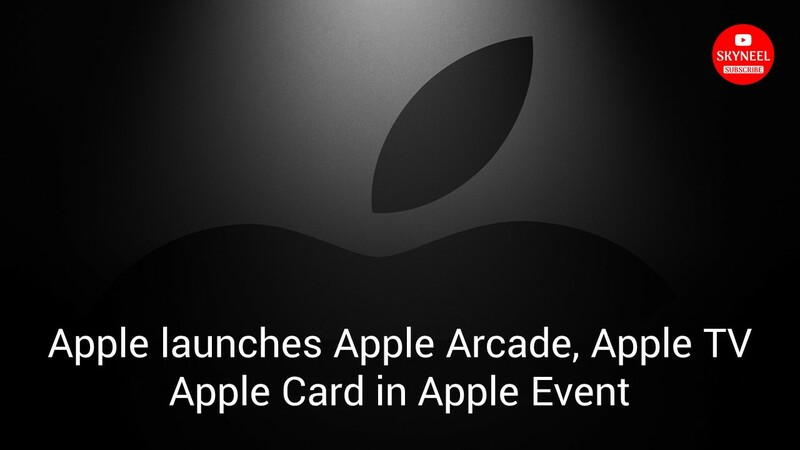 In this article we have told you about Apple launches Apple Arcade, Apple TV and Apple Card in Apple Event. If you liked this article then you can also like our Facebook page and subscribe to our YouTube channel too. If you have any problem related to this article, you can comment and tell us.